SOLD! For some reason it looks like a pink/purple gradient. How cool is that! I used one coat of ridge filler, two coats on my middle finger because that nail has more and deeper ridges. Then I added two coats of Purple Diva. The formula is on the thin side but that didn’t gave me any problems with the application. What I did learned is that it’s better to use the 3-stripes method instead of going over it multiple times. If you do go over it again it will drag and leave bald spots. A little more precision while applying will result in a lovely eye catching manicure. I’ll definitely pick up the metal chrome polish from this collection soon. I’m sold. What do you think of the mirror effect finish? 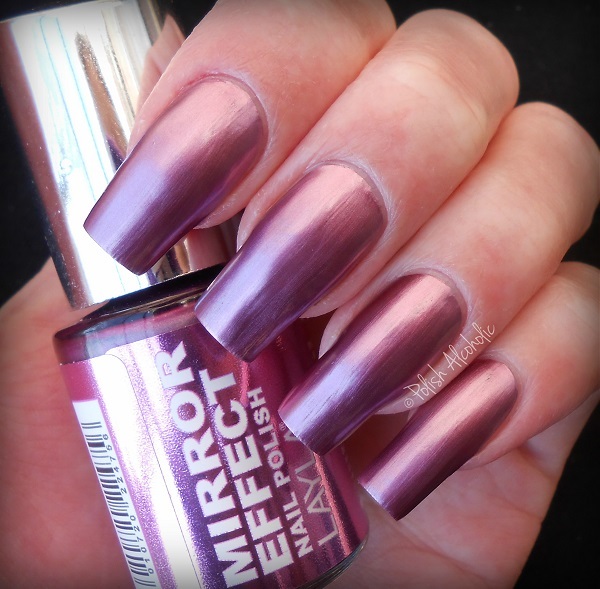 This entry was posted in LAYLA and tagged blog, layla, layla mirror effect, layla purple diva, mirror effect, nail polish, nails, pink, polish, purple, review, swatches by Polish Alcoholic. Bookmark the permalink. I understand why you’re sold! It absolute gorgeous. If it’s well executed, it looks gorgeous. And this polish is beautiful :O, suits you very well. I quite like mirror effect polishes, but I agree that you have to have really smooth and well-prepped nails before putting them on!